tihmstar's Blog: BasebandGoldCertID not found, please spam tihmstar! BasebandGoldCertID not found, please spam tihmstar! Today's topic is tsschecker's BasebandGoldCertID (or short bbgcid). 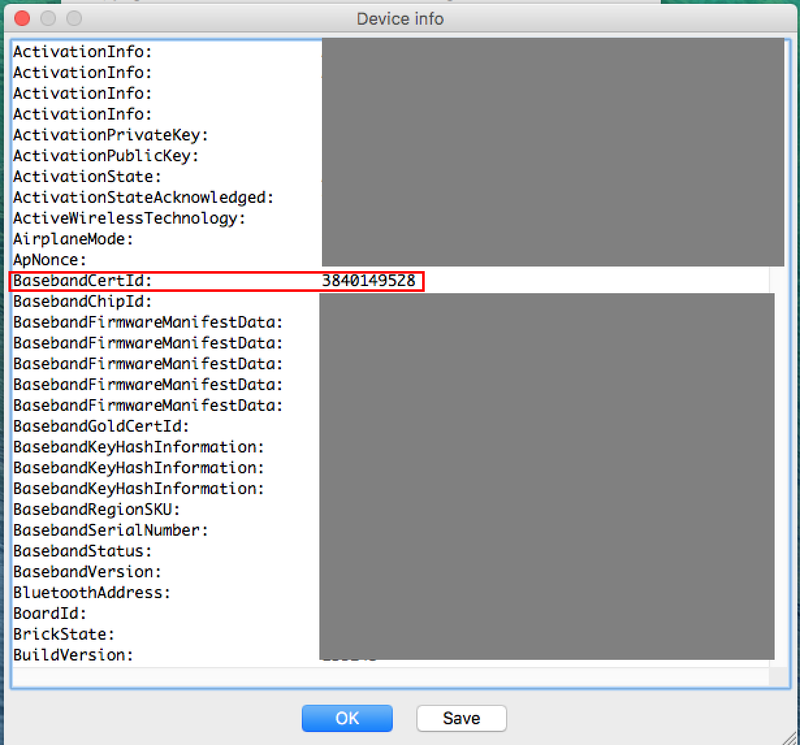 [Error] [TSSC] ERROR: device "iPad3,5" is not in bbgcid.json, which means it's BasebandGoldCertID isn't documented yet. If you own such a device please consider contacting @tihmstar to get instructions how to contribute to this project. iOS 10.2 for device iPad3,5 IS being signed! 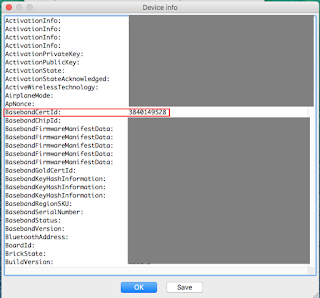 ERROR: device is not in bbgcid.json, it's BasebandGoldCertID isn't documented yet. Again, tsschecker started as a project to analyse apple's tss server. You can send customized requests and see what it responds. Beside APTickets for the main iOS system you also have the baseband. The baseband is a seperate processor, which has it's own OS. One of it's main tasks is to handle cellular communication like GSM, LTE and stuff like that (note i'm not an expert about baseband). So basically you have basebands in phone and also in iPads which have 3G or LTE or whatever. When restoring such a device you also need to restore the baseband, which has it's own seperate restore process. It also uses stuff like APTickets which need to be requested from apple while restoring (i really haven't looked into how this exactly works, these are just general observations). So we note here: when restoring we also need a ticket for the baseband. Tsschecker is able to request such tickets even though there are not many customizations yet. Does that mean i can save a basebandticket? Yes, you can save a baseband ticket if you want. When requesting a baseband ticket you need to send a bunch of values for apple. I figured out that most of these values can either be random, or omitted completely. All except the BasebandGoldCertID. This one has to be a device specifiy value matching the devicemodel. For example if you want to get a ticket for the iPhone6,2 baseband you need to send the BasebandGoldCertID 3554301762. This is the same for all iPhone6,2 models. If you don't send this exact value for the iPhone6,2 you don't get a ticket. Normally when you restore a device using iTunes or idevicerestore that value is read from device while restoring, that's why a central database was never needed. But tsschecker aims to send requests to apple's server without the need of having a real device connected (thus the name "tss checker"). So this is the reason i started to collect BasebandGoldCertIDs. Cool, does that mean i can downgrade basebande? No, unlike iOS a downgrade is not possible. This is because the baseband all this ticket and restoring and signing stuff and i don't know of anybody actively looking into it and especially actively working on a downgrade. In theory you can find bugs or something like prometheus in the baseband but right now there isn't any public tool able to downgrade the baseband (correct me if i'm wrong) and also i don't know anyone working on that. So what are the tickets even used for if i can't downgrade? Literally nothing. I don't even know if the tickets we are saving right now can be used for downgrades in future or if there's something important i left out/didn't notice. Again, i haven't really looked into baseband. So why even requesting tickets? Well the initial idea of this is just to see if the baseband of a specific iOS verison is signed or not (remember "tss checker"? :P). When i started tsschecker i didn't know this tool would be that popular. I thought i should ask everybody who even cared using this tool to help me collecting bbgcids, but right now i get spammed with emails. This is why i decided to write this blogpost to exaplain what this is all about. Ok i see. I have a device, which you don't have in your list, how can i help? Ok so basically you need to take your device and read out the BasebandGoldCertID and send me an email containig the devicemodel and the bbgcid. Then i can put that to tsschecker. You can even make a pullrequest on github with your bbgcid. If you can, please test if you get a ticket before submitting the bbgcid. If you run tsschecker with --no-baseband=2 then it will try to request only a baseband ticket. Make sure to use the "normal" version, not the beta. I sent my iPad5,4 bbgcid via email several days ago, but heard no reply. Also, I believe the iOS devices published in recent 2~3 years should have the same BasebandGoldCertID, because these devices have the same LTE/3G/2G hardware capabilities. By the way, besides bbgcid, I think the devices' "RegionInfo" (two or one character with /A in the end) should also affect the baseband ticket you received from apple. Thanks, added that to tsschecker. Though if you want to contribute to tsschecker it'd be cool if you make some pull requests. I don't want to add stuff on my own if i haven't really looked into it, so as of right now i won't change RegionInfo. HELLO, WHERE DID I SEND THE FILE WITH THE BASEBANDIT? tihm can u plz add iPad 5,2 A1550 Mini 4 cellular with BaseBandCertId: 3840149528 would really appreciate it!! Thanks!! This information shared was very useful to me. Maybe a little late, but here is one more.